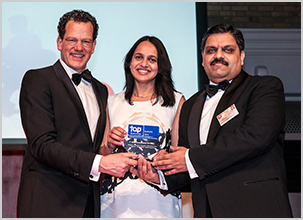 Tata Consultancy Services(BSE: 532540, NSE: TCS), a leading IT services, consulting and business solutions organization, today, announced that it has been named as the Top Employer in Europe by the Top Employers Institute for the second consecutive year. TCS was ranked first among the 20 companies that were eligible for the award. The company was recognized as an exceptional performer across six core Human Resources (HR) areas: Primary conditions, secondary benefits, working conditions, training, career development and company culture. Previously known as the CRF Institute, The Top Employers Institute is an independent organization that identifies top performers in the field of human resources worldwide. The Top Employer certification is based on independent research conducted by the Top Employers Institute and audited by Grant Thornton. This year’s survey found that TCS performed exceptionally well across all key areas of HR practice, with the company scoring particularly highly in the categories related to outstanding working conditions, training and development, career development, cultural management and company culture.